The warmth is amongst us as we approach the summer months. Days are longer where the sunsets much later and as I type this it is 8pm and the sun is still shining bright on the city in which I live, Toronto. I have a love/hate relationship with the city from which I was raised for it brings me much comfort but sometimes I wish to live in discomfort. Most people associate discomfort with negative ideas but to me discomfort can be necessary to learn and grow. Basically I’ve been itching to leave Toronto to experience a new culture, language, and life. It has been two years since I’ve left for a new experience and it has left me unhinged. I’m not even talking about wanting a vacation for a week or two but for months at a time. I really want to get to know the culture, people, and possibly learn a new language or skill and that can not be learned in 1-2 weeks. I know a lot of people can’t just take off for months at a time but I suggest you should do it at least once every few years. Being in a new place where you barely know anything can leave you with a discomfort you’ve never felt for there are significant differences (for example food, social norms, fashion, behaviours, laws, etc.,) but you’ll gain experiences and knowledge you will never know from being comfortable. At times when I was in China I found myself in uncomfortable situations. Chinese woman dressed differently and I had to distinguish how much skin I could show in the light of day. In China things that were logical behaviours to me where not so logical. I remember some woman jumping a head of me in the bathroom line I created, without a flinch of an eye and she fully took the next available stall in which I was shocked and appalled. I slowly learned that you have to stand in front of an actual bathroom stall instead of creating a queue. Traffic laws and behaviours were different from what I am used to, it is every man for themselves – the bigger the vehicle, the more authority you have on the road but a group of people crossing trumped that notion for the most part. The most difficult transition in to this new world was communication for I don’t know Mandarin nor did James. 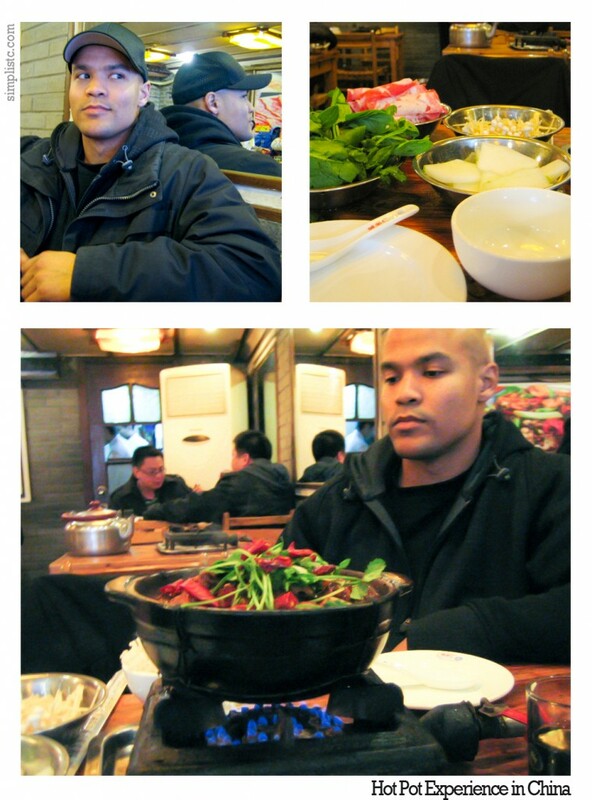 We went to a hot pot restaurant where he went with his friends and recommended that we should go for we were in the area. We sat down and the server gave us our menus and everything was in hanzi or better known as Chinese characters. There were no photos of food on the menus and James failed to forget this for his friends ordered the food for him when he went prior. So we did what made sense and started to point at other people’s food but the server and ourselves still didn’t quite get it therefore the server just pulled James to the kitchen in which James pointed at the items we wanted in our hot pot. Problem solved. It was frustrating on both parts but quite amusing at the same time. It was an uncomfortable for communication was really difficult, but in the end we got what we wanted which was to fill our bellies. Until this day I’m still not sure what meat we ate but I am still alive to tell the story, which is what matters the most. The lesson we learned from the experience was that we are not going to a restaurant without photos on the menu or a translator with us. Sometimes resolution is plain and simple. You need to experience a little discomfort to learn and grow hence why they call it growing pains. Life is about experiencing new things, so get out there and live!